A couple of weeks ago, I was scrolling down my Facebook feed and saw a post about Operation Cookie Takeover and was immediately intrigued. Over Memorial Day weekend, The History Channel was running all sorts of military and war documentaries and I was feeling extra patriotic after watching them. Did you happen to see the 10 part series WWII in HD? If not, I highly suggest it. I've never considered myself a history buff, but it's completely interesting. Whoever remastered those films did an excellent job. Next on my DVR is The World Wars and I can't wait to start on that. Okay, okay, so back to the cookies. So I decided on these Chewy Sugar Cookies from Cook's Illustrated, and I'm SO glad I did. They are definitely going to be my go-to sugar cookie recipe from now on. They were the perfect amount of chewy to crispy and tasted fabulous. To make them festive, I just rolled the sugar cookie dough balls in red, white, and blue sanding sugars. Preheat oven to 350 degrees. Line 2 baking sheets with parchment paper or silicone baking mat. Whisk flour, baking powder, baking soda, and salt together in a medium bowl and set aside. Place sugar and cream cheese in a large mixing bowl and pour in the warm butter. Whisk to combine. Then, whisk in the oil until combined. Next, add the egg, milk, and vanilla extract and continue to whisk until smooth. Add the flour mixture and mix together with a rubber spatula until a soft, homogeneous dough forms. On three different plates (I used paper plates), pour out about 1/4 cup of each color sanding sugar. (i.e, blue sugar goes on one plate, red on another plate.....) Working with 1 1/2-2 tablespoons of dough at a time, roll into balls and then roll the balls in desired color of sanding sugar, making sure the ball is completely coated in sugar. Bake 1 sheet at a time until the edges of the cookies are set, 11 to 13 minutes (I did 11 minutes exactly). Let the cookies cool on the baking sheet for about 5 minutes and then transfer them to a wire rack to cool further. This recipe will make about 2 dozen cookies. I, of course, made more to send off and this recipe was easily doubled. Very cool! Those are some lucky soldiers who will get to eat your cookies! 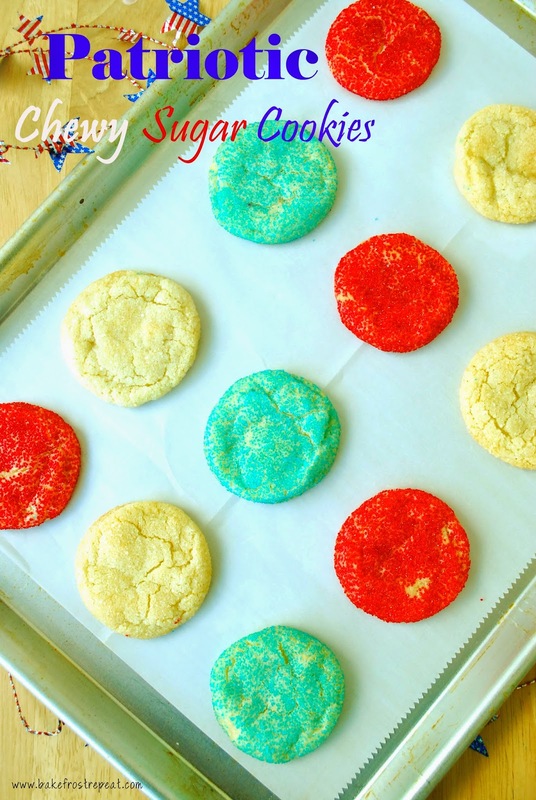 Any sugar cookie I don't have to roll out is a winner in my book! And I love the idea of sending cookies to soldiers. I am going to look into doing this with my boys! No roll sugar cookies? Hooray! 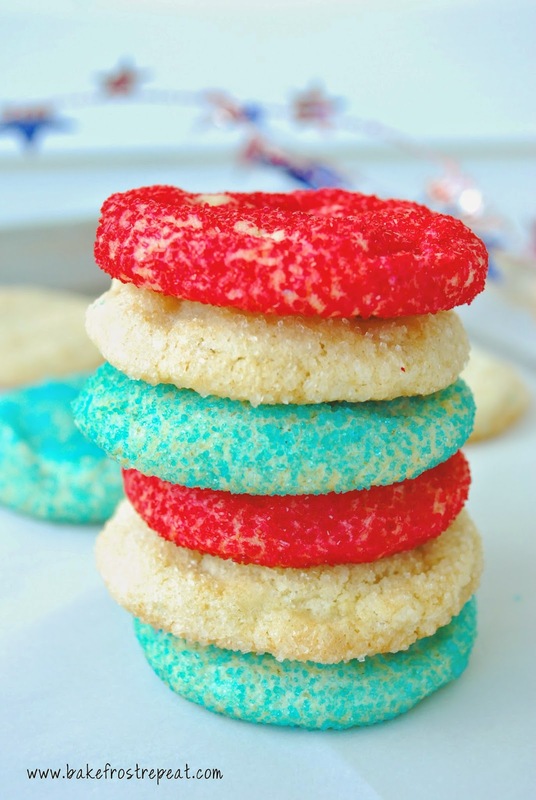 And I am SO excited for the 4th, these cookies make me happy! Amazing colors, too, not at all washed out! I love chewy cookies:) The bright colors make me happy too!